I've tried to catch a Paragon with my Onslaught, but it isn't working. Either I get Paragon And Friends - oddly I don't fare so well ramboing against multiple capital ships and/or Auroras - or the Paragon deploys last and runs away because everything else is dead. Easy for me, Gauss cannons to the rear and it seems they can't outrun that, further shots overload - flameout - dead. Here is my favorite Paragon loadout. I've found it to be the most effective in every situation, whether directly or AI controlled. No missiles. All slots are: Autopulse, Pulse, or IR pulse, exceptions being the two rear side small mounts, which are burst PD. 1875 flux dissipation and accelerated shields are especially helpful when the AI controls it, for obvious reasons. 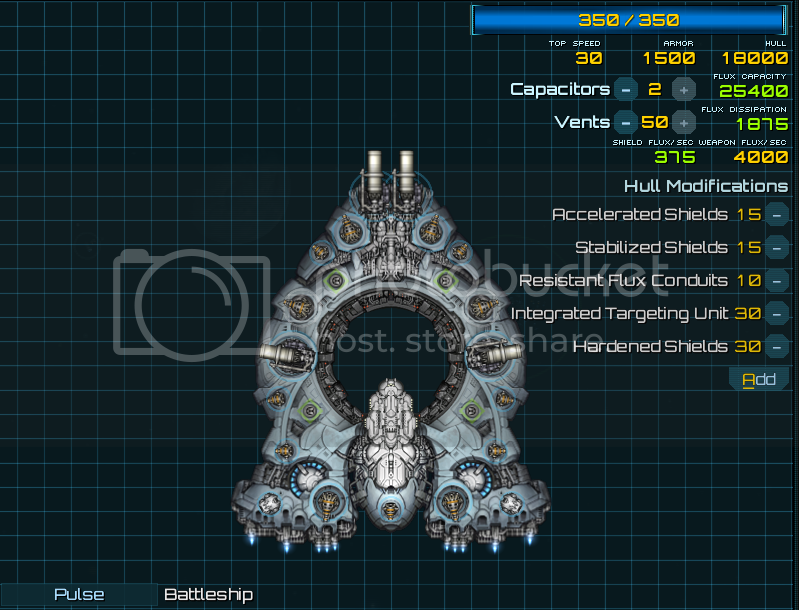 With manual control and careful flux management, this loadout can easily defeat multiple enemy capital ships without taking hull damage at all, even default Paragons. The ridiculous barrage of pulse lasers is even reliable for taking out incoming missiles from any angle, though the burst PD in those high-coverage turrets often help. However, I'm fairly convinced that there could still be improvements made to this loadout to further increase general effectiveness. I just wish there were more choices for small energy mounts. I know this loadout - I've done similar. I sacrifice the rear Md turret for Sm weapons to free up some more OPs (I dump them in capacitors ). Piloted well, what you need to kill is always in front of you, never behind, so the rear weapons are kinda redundant for me. I still leave something there to help take out fighters and smaller, faster ships though. As nice as that is, I find that I rarely end up using all that firepower in a close-in engagement (beyond Forlorn Hope) and it's really hard to justify not having tachyon lances on the side turrets for fighter/frigate sniping and massive EMP damage. Tach-Lances take a bit of the fun out of actually doing something with the Paragon. I find myself preferring to actually getting in the brawl to beat the bloody hell out of something rather than hanging back and just sniping stuff from stand-off ranges. Well, assuming I'm even in a Paragon as my player ship/flagship. (I'm usually not since I despise the lack of speed.) For AI use, though, yeah; I go Tach-Lances for my AI Paragons. I mean, that's the problem with the Paragon. Without tachyon lances, you don't contribute to most fights because of how slow it is, and it ends up feeling like a waste of 25 FP. With the tachyon lances, you can get your money's worth, but it's less fun to take into the rare fight where you can actually get within range. The Odyssey can hold three tach lances plus carrier duty for 18 FP, isn't that a better deal? It's a hell of a lot faster too. The Paragon is really really tough to kill, but by the time it gets to the fight generally things are either going swimmingly for your side and it acts as cleanup, or you've gotten destroyed so hard that it can't really turn the tide and just ends up dying expensively, costing the other side a few extra ships. Did the engine boost mechanics get changed in the latest patch BTW? It doesn't seem quite so hard to bring those heavy things to the frontline now. My Onslaught gets to the battle pretty quickly now. I can close in on enemies pretty quickly if I don't open fire until my shorter range weapons are in range. In 200 FP battles, I deployed my capitals in the second wave, and that was enough time for them to reach the fight and rack up kills. With the 100 FP battles, I've been deploying one first wave. My problem seems to be knowing where the battle will be so that my ship doesn't end up on the wrong side of the map. I love beams...especially Tachyon Lance, it's essential if you don't have enough fast ships to capture points. IMO energy weapons are not good at fast-kill, that's Onslaught's job, because so I treat Paragon as a constant, powerful and deadly medium range supporter, using beams to pressure enemies up, stack their hard flux with autopulse laser, finally let someone else to finish him. Aren't all those beam weapons? If so, ITU doesn't help much. It helps more, actually. I'm not great at the maths, but fifty percent of one thousand turns out to more than two hundred. Even tact laser gets +three hundred from ITU on cap ships, as I understand it. I though ITU only boosted projectile weapon range whilst advanced optics boosted beam weapon range.